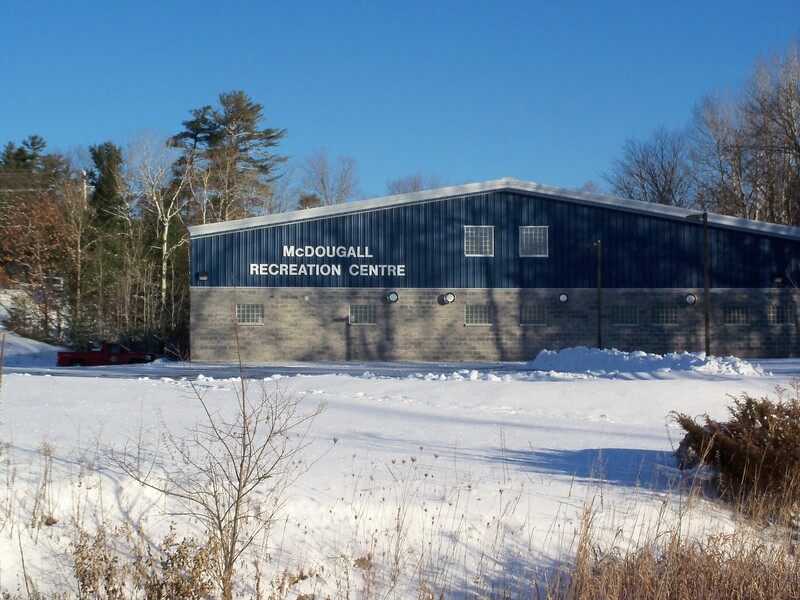 The McDougall Recreation Centre Rental Form can be found by clicking here. Located at 148 Hammel Avenue in Nobel, this new facility consists of a concrete play surface, state of the art dashboard and glass system, two heated washrooms, two heated change rooms and a kitchen/concession room. The facility has a covered roof system and is enclosed on three walls. The second floor area is currently NOT open to the public and is off limits to everyone except Municipal staff. This facility is used in the summer season for ball hockey, rollerblading, skateboarding and other activities. There is also a very active group called the Nobel Shuffleboard Club. The surface inside the boards has 14 courts painted on the floor and the club operates Tuesday and Thursday afternoons from 1:00 p.m. – 4:00 p.m. The 75 member club is active from early May until Thanksgiving and new members are welcome. The play surface also contains a full basketball court which is open for use in the non-winters season. During the winter months, the Municipality maintains a natural ice surface which is maintained on a daily basis with an Olympia Ice Resurfacer. There is ample parking on site. The skating area rink is lighted and is open daily (weather permitting) from 9:00 a.m. to 10:00 p.m. Please remember, the rink is open to all persons and there are scheduled times for skating and hockey. There is ample seating with benches and bleachers around the ice surface for participants to relax between skates. A video walkthrough can be found on our Videos page. Open ice time has no set activity scheduled. Permissible activities during open ice time include skating, hockey, broomball and ringette. On school days, the school skating schedule takes precedence over open ice time. The school skating schedule is posted at the arena. Special events such as school skating programs and Municipal recreation skating programs may supersede the daily schedule. During skating times, no hockey sticks or pucks are allowed on the ice/during hockey times; please do not try to skate. Cooperation between the different users is paramount for safe operation and enjoyment by all. This is a non-smoking facility under the authority of provincial no-smoking legislation.